Front Street Baptist Church, a growing church in Statesville NC determined the need for a redesign of the west entrance. This typical breezeway provided handicap accessible entrance to the west side of the main sanctuary and entrance to the Education building. The enclosure of the breezeway created a climate controlled passage between sanctuary and education buildings, the handicap ramp was improved and the addition of men’s and women’s restroom facilities on the sanctuary level. Handicap accessible showers were also added to each of the restrooms for members participating in baptismal activities, shelf space above the toilets for church member belongings was a not missed detail. Renovation and Construction were handled with minimal disruption to the daily operations of the church. 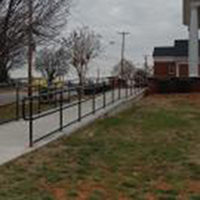 The handicap ramp installed first prior to all other construction, insuring safety to church members with disabilities. The completion of the renovation and addition was complete before Easter services. Front Street Baptist Church members were specific in their needs for the renovation and addition, Hennon Group Architects exceeded their expectations, creating several spaces for the congregations comfort and years of enjoyment.